Every now and then, it’s good to go back to the blueprint. And this is as good as you’ll get. 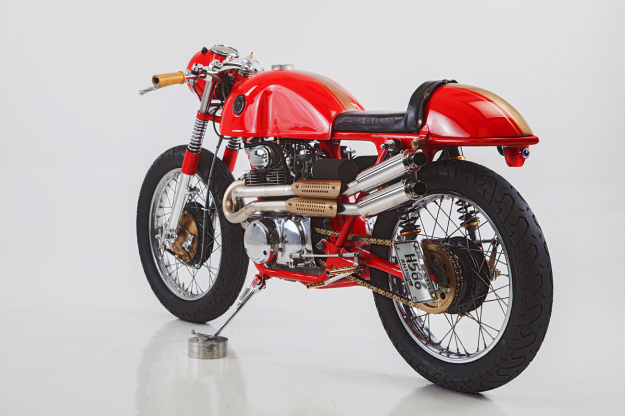 It’s a textbook resto-mod of a classic 1970s Honda, dripping with charm and style. Builder Jan Sallings has an eye for detail—and the steady hand required for quality work. 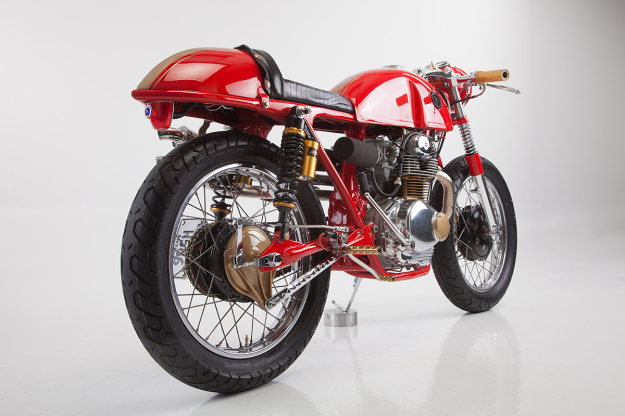 The mods he’s made to his 1973 Honda CL 350 are a great guide for anyone who wants to give their vintage bike a dose of café racer flair. The basics are all there: Jan has detabbed the frame and smoothed out the welds, and added extra bracing above and below the engine. The tank is a Benelli Mojave—probably one of the few remaining in the USA—and massaged to fit the frame. It’s topped off with a gas cap machined from billet aluminum. 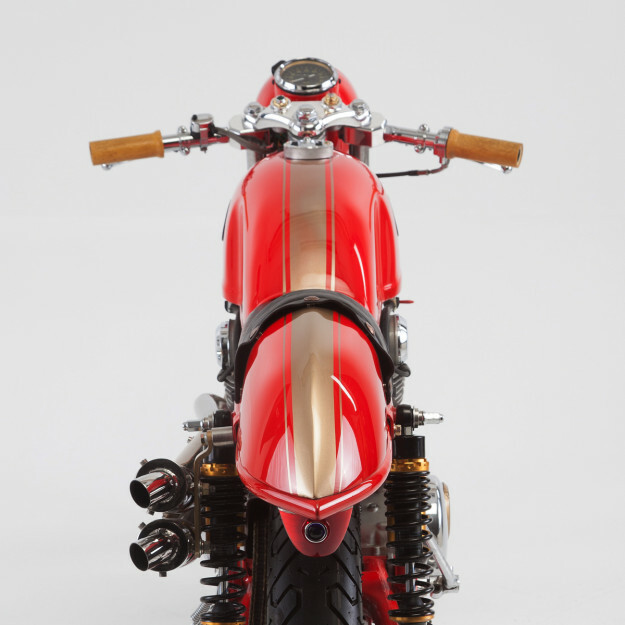 Up front are custom fabricated aluminum clip-on bars with wood grips, and the headlight from a 1960s Honda Scrambler 305. The controls are minimal, adding to the pared-back vibe of the bike. All components have been overhauled, and if they haven’t been painted in that lustrous red, they’ve invariably been polished to a deep sheen. That includes the fork legs, and the spokes and rims of the wheels. Look a little higher and you’ll spot chromed springs on the forks. To give the Honda a bit of extra zip, Jan has completely rebuilt the engine and carbs. With painted cases and polished covers, the powerplant now looks better than factory-fresh. 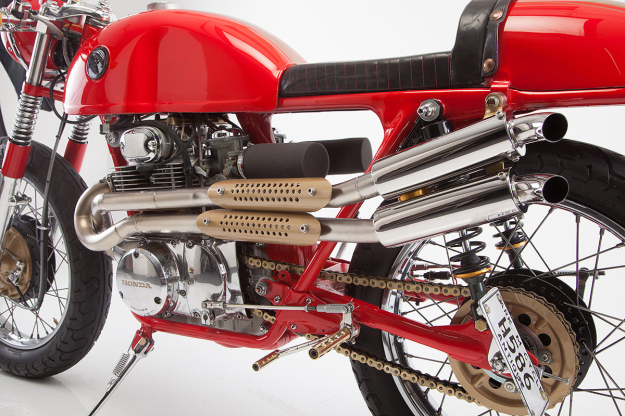 But the pièce de résistance is the hand-made exhaust system, fashioned from stainless sheet and tubing, with highly polished headers and mufflers. Perforated and painted guards keep the rider’s thighs as cool as the bike itself. Out back is a custom cowl, which does double duty as a hiding space for the key electrical components. It’s finished off with a 1952 Chevy taillight with a blue dot center. 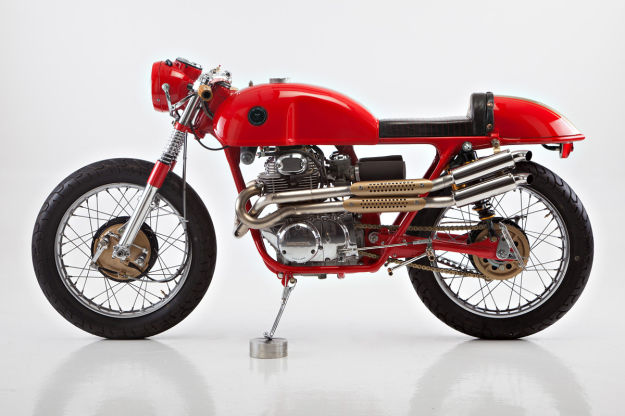 Anyone else out there tempted to trawl eBay for an old Honda CL 350?